The Master Coach Accreditation programme meets the standards set by the European Mentoring and Coaching Network for Masters level and is suitable for professional coaches who have worked for over 5 years with clients at senior management and Board levels. The accreditation recognises your prior experience and education without the need to attend lectures or submit essays. 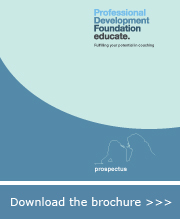 You will be supported throughout by an experienced coach and have access to a range of resources as you prepare a portfolio to evidence your Master level competence in either coaching or Business coaching. It normally takes 6 months to 1 year.